Come to Community Park on Saturday, when West Windsor will be honored during the BikeFest festivities for being New Jersey’s first bicycle-friendly community. Jen Laurita will present the award on behalf of the League of American Bicyclists, a national non-profit organization that honored West Windsor with a bronze medal in September. BikeFest is one of the many reasons that the community was selected. Other criteria include educational events (such as BikeFest’s Bike Rodeo to teach good biking skills), infrastructure (the many bike lanes that have been added over the years) and government policies. The award will be given around noon, after riders are back from their rides (anywhere from 1 ½ miles to 40 miles) and grabbing lunch and just as the DJ gets going and the kids take over the moon bounce and giant slide. Stick around to applaud West Windsor! You also have a chance to win one of 10 $25 gift certificates from Halter’s Cycles on Router 1 in South Brunswick. Not signed up for BikeFest? You can register here or on Saturday at Community Park. (Rain date is Sunday.) Registration begins at 7:30 a.m. If you feel confident about your bike-handling skills but haven’t yet mustered up the courage to try road riding, this class is for you! WWBPA member and League of American Bicyclists’ certified instructor Les Leathem will teach a Traffic Skills 101 course at the Senior Center on Friday May 11 and Saturday May 12. WWBPA members who complete the course will be reimbursed $25, and the first five members who write us an account of your experience taking the course will be reimbursed an additional $25! Please see the West Windsor Recreation Division web site for course details. The West Windsor Bicycle and Pedestrian Alliance is very pleased to announce that the League of American Bicyclists proclaimed West Windsor Township a Bicycle Friendly Community, at the Bronze level. This is the first time a New Jersey municipality received such an honor, the result of more than 10 years of effort on the part of many residents and with the support of the mayor, township council and county and state officials. It could not have happened without the support of our members, who have demonstrated that they value a bicycle and pedestrian friendly community, both with their membership contributions and their time spent helping others to ride. As an all-volunteer organization, we appreciate our members’ willingness to help, whether it’s to write letters of support or to teach children to ride a bike for the first time. This honor isn’t only for our officials and the WWBPA, but for all our community partners who help make bicycling happen. We especially thank BikeFest and our area bike clubs, who organize so many successful biking events, the SMART/JORBA volunteers, who maintain the off-road trails in Mercer County Park, and all the many individuals, organizations and businesses who have helped make West Windsor a better place for daily cycling, whether to work, school or the Farmers’ Market. Finally, a special thanks to our intern, Kim Meersma, who worked with many people to gather the information necessary to put together a very detailed application. The League of American Bicyclists has released its latest rankings for bike-friendly states, and New Jersey comes in fifth. Only Washington state, Maine, Wisconsin and Minnesota outrank us. Yes, we do better than Colorado (No. 8), home to bike-friendly Boulder, and Oregon (No. 12), despite the incredible biking infrastructure in Portland. We’ve also moved up from 8th last year and 10th in 2009. That’s some of the good news. Here’s some of the bad: We get a “D” on infrastructure and don’t get an “A” in any category. We’re more like a “B” student — Bs for legislation, policies and programs, education and encouragement, and evaluation and planning. We get a “C” on enforcement. Amazingly, we come in fifth without any bicycle-friendly communities. How does the League come up with its rankings? 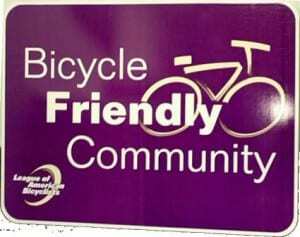 It uses a multi-faceted Bicycle Friendly State (BFS) questionnaire that is answered by each state’s Bicycle Coordinator. The data collected – based on 95 questions, across six categories – is verified by League staff in concert with advocates in each state. 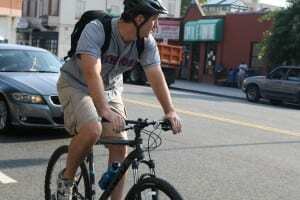 States that continue to promote bicycling and improve conditions can expect to improve their scores. Why bike with traffic? There are lots of good reasons to bike to the grocery store, school, or the post office: better health, less pollution, save some money, among others. But it’s not as easy as a quick drive to and then bike on the D&R Canal path; you have to know how to successfully navigate with the other, larger vehicles on the road. There’s a training course just for that, and it’s being held in nearby North Brunswick! 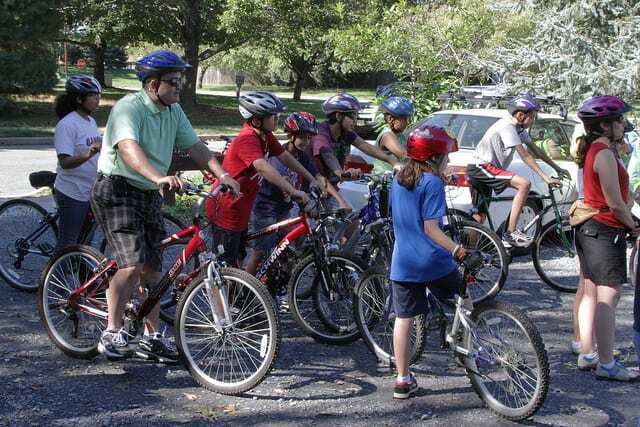 The North Brunswick Township Parks and Recreation Department is proud to partner with the New Jersey Bike and Walk Coalition Bicycle Education Program to offer Traffic Skills 101 for bicyclists. Following a well-established curriculum from the League of American Bicyclists and taught only by certified League Cycling Instructors, Traffic Skills 101 gives cyclists the confidence they need to ride safely and legally in traffic or on the trail. The course covers bicycle safety checks, fixing a flat, on-bike skills and crash-avoidance techniques and includes a student manual. Recommended for adults and children above age 14, this fast-paced, nine-hour course prepares cyclists for a full understanding of vehicular cycling.The class will be limited to 15 students and will only be held if more than 5 students are registered. Please click on this link to the WalkBike Jersey blog for more information, and enjoy the course! Andy Clarke, the president of the League of American Bicyclists, will be the guest speaker at the WWBPA’s annual meeting on March 17. You may remember that Andy was supposed to speak at our annual meeting in February 2010, only to have it snowed out. So we’ve moved the annual meeting to March and Andy has agreed to come again, fresh from the League’s annual National Bike Summit in Washington D.C.
Save the date and tell your bicycle and/or advocacy buddies. All are welcome! More details closer to the date.